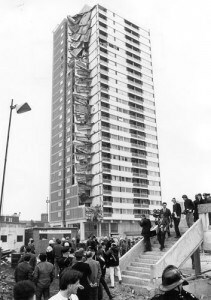 1968: Ronan Point Disaster – Weaknesses in the design. The Ronan Point disaster of Newham, UK occurred May of 1968 due to a gas explosion on the 18th floor. When a tenant lit a match over their stove, an explosion destroyed her flat, consequently taking out the walls of the entire corner of that 22 storey building. The explosion was the catalyst to the weaknesses in the design and construction at Ronan Point. First of all, the Larsen-Neilson precast concrete system used for the structure was inappropriately applied. The system was primarily for buildings six storeys tall, and the Ronan Point was 22 storyes. This meant that extra live and dead loads of the building would not be appropriately handled if this Larsen-Neilson system were to be used. Because of the minimal amount of joints connecting the prefabricated concrete pieces, the large loads of a large building would over stress the joints. Configuring any building this way, much less a tall building, will not allow multiple paths for the building load forces to flow in case of a failed member. The design team needed to acknowledge the safety hazards that come with larger residencies, but the cursory construction did not help the situation. After analyzing the joints after the explosion, some of the joints were not screwed tightly. Even more, voids filled with garbage were found in place of the appropriate construction material designated in construction documents. It was a combination of several factors that made Ronan Point waiting for disaster. 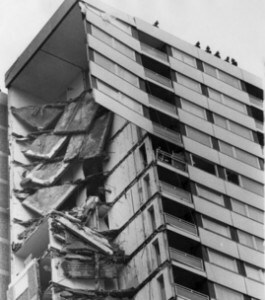 Ronan Point was repaired with blast plates after the initial building failure. It was eventually torn down, floor-by-floor, to observe the joint connections of the precast large structural panels. Consequently, the Modernist movement in England declined in popularity. Since the incident, the building industry learned many lessons: one of progressive failure and another of “robustness” in design. Because of the damage to one flat, the floors above and below it failed. Failing this way placed many people in danger. Out of Ronan Pont’s ashes came “robust” design, which plans for several paths for forces to travel. As a result, if one joint fails, the rest of the building will stand.